Boguslaw Cyganek has been teaching at the AGH – University of Science and Technology since 1993 and is now a Lecturer and Researcher in the Department of Electronics and Computer Science. His research interests include the development of image processing systems, robot vision and neural networks. During this time, he has gained several years of practical experience working as a Software Development Manager and a Software Engineer both in the USA and Poland. He has also written Three Dimensional Image Processing (Academic Publisher House, 2002) and 18 academic papers on image processing and algorithms. Dr Jan Paul Siebert is currently Director of the 3D-MATIC Research Laboratory in the Department of Computing Science at Glasgow University. His research interests are in computer vision, image processing, and 3D imaging by stereo photogrammetry and its applications in 3D whole human body imaging. He is Scottish Chair of the BMVC and prior to his current position he was Chief Executive of the of the Turing Institute, Glasgow, which developed the ‘C3D’ imaging technology. He has written over 50 journal, technical and conference papers on 3D image processing, modelling virtual images and photogrammetry. 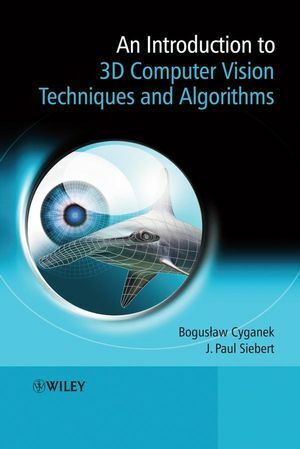 An Introduction to 3D Computer Vision Techniques and Algorithms Visit the companion website to download software examples, case studies and exercises.